A light sensor is a sensor that measures the amount of light that it sees. It reports the amount of light to the RCX as a number between 0 (total darkness) and 100 (very bright). 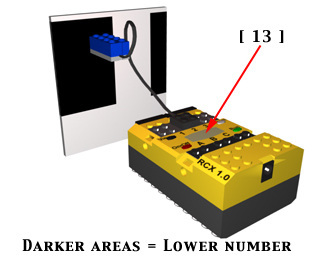 The light sensor can determine if it is seeing a white piece of paper or a black piece of paper. When the light sensor is over the white paper, it reads a value of 50. When it is over the black paper, it reads a value of 13.